Do you feel that what you?re learning in school has nothing to do with your life? Do you feel that school's not really preparing you for the real world? If you answered ?yes? to these questions, then this audiobook is for you! When Robert Kiyosaki was growing up, he wasn't exactly an ?A? student, but it wasn't because he wasn't intelligent. He just learned in a different way than the teachers in the school expected him to. Then Robert found a mentor who taught him about money and investing. Robert became so successful that he was able to retire when he was still a young man. 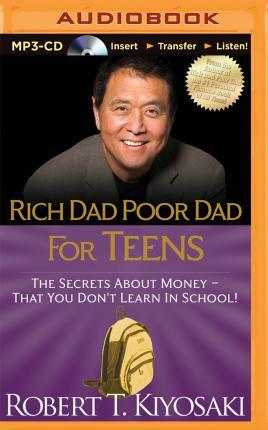 Rich Dad Poor Dad for Teens doesn't just share his amazing personal story. It shows you how to make choices today, choices of the rich. Packed with straight talk, sidebars, and quizzes, this audiobook will jumpstart your personal success by showing you: How to speak the language of money ? Ways to make money work for you ? Tips for success ? including ?work to learn, not to earn? ? Games that help you understand the tools to keep money moving and growing. Picking up where school leaves off, Rich Dad Poor Dad for Teens is the secret weapon for gaining the freedom to create the wealth you want. No matter what your grades are, you are smart enough to thrive financially. It is never too early to begin learning to be smart with your money.